Shredder8 is a free Windows 8 File Shredder. It can permanently delete your files and folders from any storage space that you have specified. In addition, it can permanently clear any data that you have deleted previously, but can be recovered by using the recovery tools. 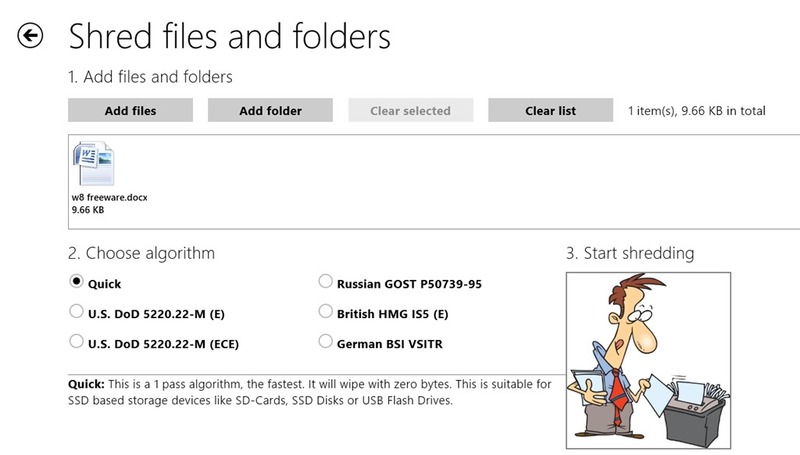 This Windows 8 File Shredder provides the user with the ability to choose from U.S DoD 5220.22-M (E), U.S DoD 5220.22-M (ECE), Russian GOST P50739-95, British HMG IS5 (Enhanced), and German VSITR methods for shredding your files and folders. 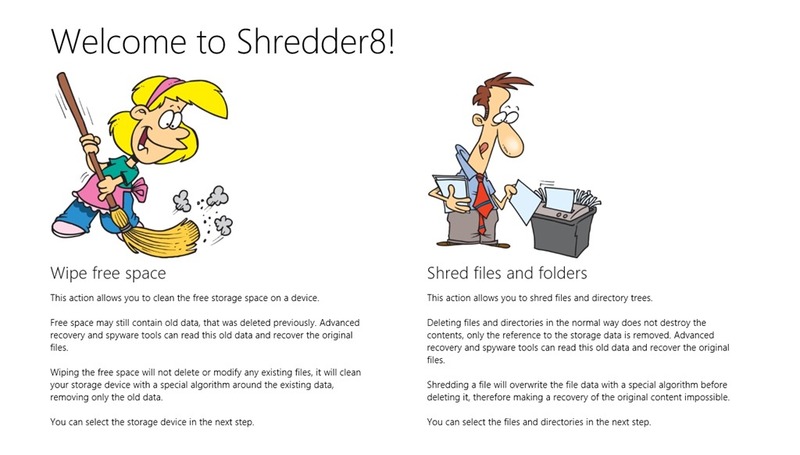 This Windows 8 File Shredder is freely available in the Security category of the Windows Store. 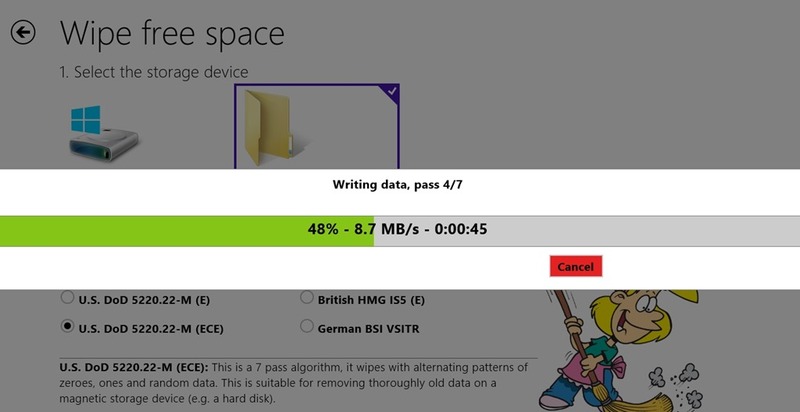 In this option of this Windows 8 File Shredder, you can clean the free space from any specific location on your system. This means that, it will permanently delete and clean off any data that could have been previously deleted but could be recovered by using the recovery tools. Using this option, there would be no chance of recovering the deleted data by using the recovering tools. 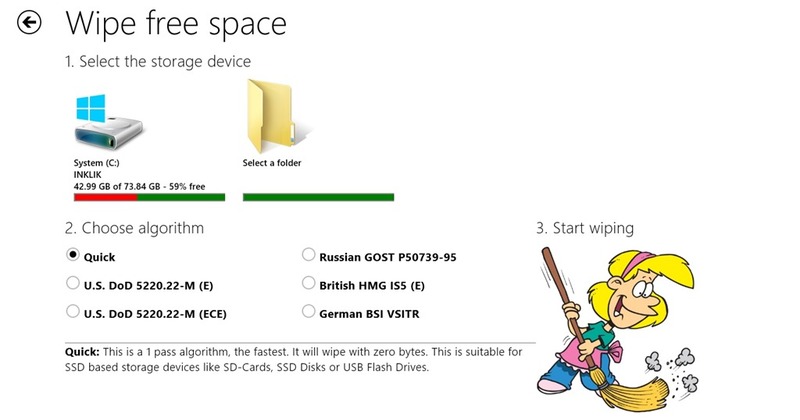 For this option of this Windows 8 File Shredder, first locate your storage and then specify the shredding algorithm you want to follow to shred. Then, click on the picture of the sweeping girl that is given on the right corner of this option to start shredding. In this option of this Windows 8 File Shredder, you can permanently delete and clean up any file or folder. The file or folder would be deleted and cleaned and all the memory space would be rewritten with some wrong and unuseful data, to prevent any kind of recovery. Use the same method to start the process. After selecting your method, click on the geeky guy (seems from the picture). The process would completely clean your data and will overwrite the storage space. It will overwrite it as many times as you select it (on the basis of method you choose). Provides a nice interface to the user. Shred your files and folders easily. Clean your free space more efficiently so that it can’t be recovered later, even by using recovery tools. Finally, to wind it all up, I would like to say that the tool is quite handy and efficient for safety purposes. If you want to prevent leaving any traces of data recovery on your system, give it a try for sure. Don’t forget to share your experience with us.